We tested these three pumps (from right to left): the Bosworth, a Sealand (typically used for holding tank pump out), and a Johnson Viking pump. Using our most scientific methodology the pumps were set at a level of 40”/1025mm above the waterline, with an additional 50”/1250mm of lift after the pump outlet. A DC power supply insured even voltage. From the local laboratory supply we sourced this measuring beaker, and then using the stopwatch app on the iPhone, measured time to fill. The most expensive Bosworth pump had a yield of 4.45 US gallons/16.8 liters per minute. The less costly Sealand pump was good for 4.74G/17.9 liters per minute. And the lowest cost Johnson pump came in at 6.45G/24.4 liters per minute. We are now testing the Johnson pump for longevity. After the first 24 hours of constant operation it was still going strong. 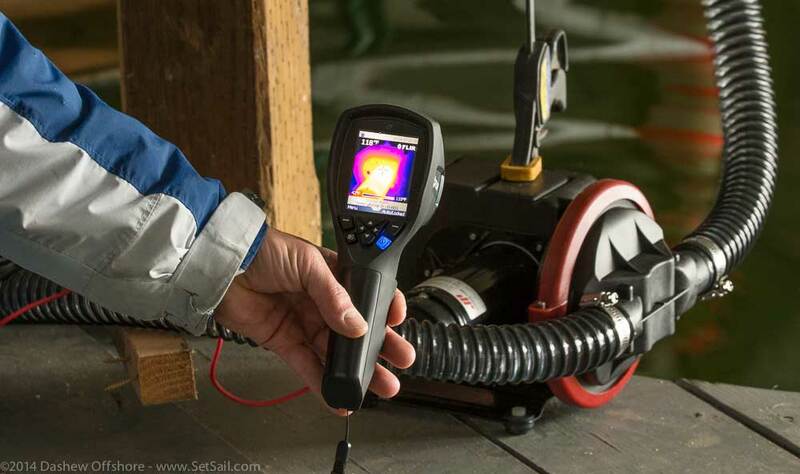 Mark Fritzer is checking the temperature using our thermal imager. The next morning, after running all night, the motor temperature had risen seven degrees F. Ambient temp was 66F during the previous afternoon and in this shot ambient was 67F. In this image Mark is looking at the end of the pump diaphragm. The cooler temperature is the result of the water being pumped through, as well as the fact that the gears are not generating heat while working. We are going to run this pump until it dies, and then hold an autopsy. If you have a favorite pump, or one you’d recommend against, we would love to hear from you. This entry was posted on Monday, April 21st, 2014 at 4:14 am and is filed under Cruiser's Tech Talk. Both comments and pings are currently closed. What about Oberdorfer? They make a variety of bilge pumps as well – and surprising lift heights with centrifugal models. Or do they not qualify for your program from a quality standpoint or weight perhaps? I think their MTBF is something like forever though. Hi Rod. Oberdorfer makes good pumps, but to my knowledge they don’t offer any diaphragm pumps. The ability of a diaphragm pump to pass through anything that makes it past the initial “strum box” in the bilge makes it most suitable for this application. When built right, they have proven very reliable and hard to damage. I was thinking about their various flexible impellers that provide remarkable lift compared to what others’ flexible pumps provide. But of course, you are right that you would still need to employ progressive screening in the strum box, and they do have modules that are pretty easy to change out if the worst happened. But I think the smallest they make in that category is a little higher capacity than what you guys spec’d Not sure there is such a thing as too much capacity when it comes to bilge pumps. Hi Rod. We took some video that we will provide a link to in an upcoming post – of the diaphragm pump passing through objects that would never make it through an impeller pump. All of the pumps we employ are fitted with strainers, or “strum boxes”, to help prevent this from being a problem. It is the ability of the diaphragm to resist clogging, that gives it an edge as our general bilge pump. For high capacity, we rely on a completely separate hydraulically or electrically driven high capacity pump system. If the ingress of water is serious enough to warrant capacity beyond the diaphragm bilge pumps, we want the 100+GPM centrifugal pump capacity (controlled by reed switches) to give us a fighting chance. Hi . Interesting. I have found in replacing and servicing pumps for the last many years that corrosion has been the usual determining factor. The cheaper pumps last longer when they get regular exercise than when they dont get used but the better pumps last a lot longer and give their performance without loosing very much over time. Also the better pumps do tend to be more expensive. Jabsco pumps selected for task generally work for me. Hi Ken. Yes, corrosion is a common issue, as sea water tends to stay standing in the pump. 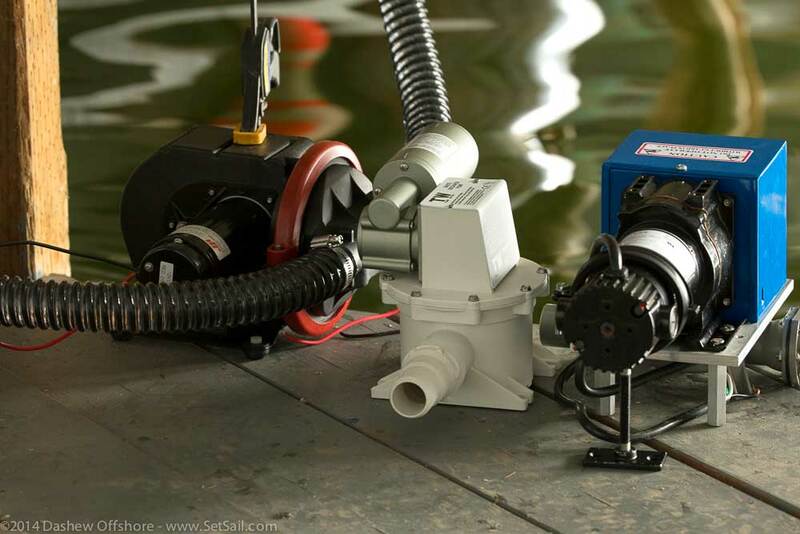 Diaphragm pumps with large bellows, simply made with minimal parts exposed to the water passing though – appear a much better solution than the Jabsco 34600 series pumps we have typically used in the past (now discontinued). NOTE that these are supplemented by the Crash Pump that is fitted to each FPB – a Pacer hydraulically driven, high capacity vane pump. I’m not completely convinced of the accuracy of your test description. You say “an additional 50”/1250mm of lift after the pump outlet”, however, the hose does not end until it has returned to your holding/measuring container, 50 odd inches lower again. As there is a continuous water column I am sure you are gaining some syphon effect from the water falling from your 50″ height. I am no physicist, but that seems logical to me. Obviously it’s not easy to get your container up to that height to conduct your measuring, perhaps there is someone with experience in this field who can explain (in layman’s terms) why I am wrong, or how your numbers may need to be adjusted. I’m sure you have a subscriber with that knowledge – actually, I’m sure there’s someone on the FPB team…? Hi Justin. Your point is well taken, however our objective was to put all three pumps through the same test, keeping all else as constant as possible. Rather than proving a manufacture specification, we attempted a crude, but effective (?) 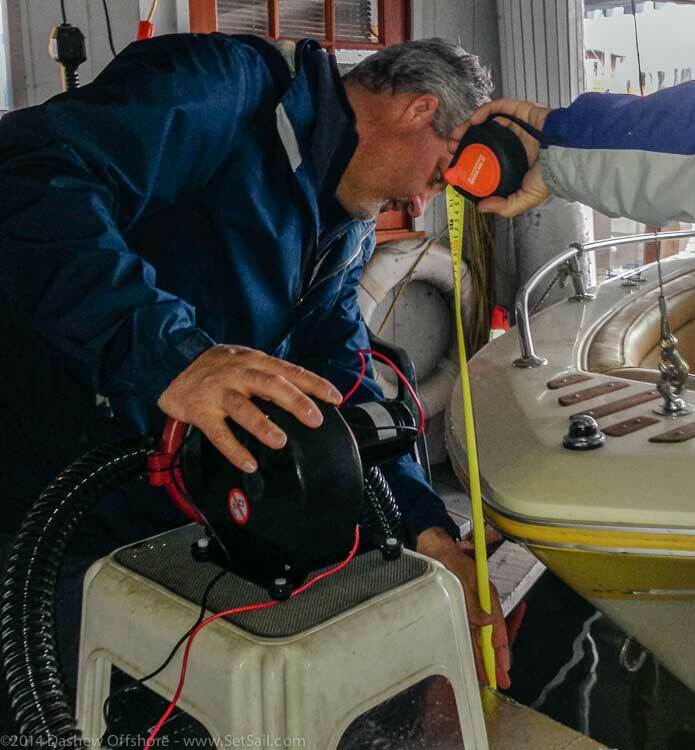 means by which to replicate currently installed, and likely to be installed, bilge pumps on our FPB’s – and measuring the results. Due to variables of install, and variations on how manufactures conduct tests – most data is tough to translate into real world performance. We simply created our own method by which we felt comfortable comparing. I was very interested to see your choice of pumps. It seems that many of these are really intended as waste pumps as opposed to your typical high volume bilge pumping application. To me, common sense would discourage submersible bilge pumps in aluminum vessels so I prefer these type for light duty requirements and have a large damage control pump. I invested quite a bit of expense and effort to install 7 of the Johnson pumps in 1.5 and .75 inch varieties about 4 years ago for use as bilge and grey water pumps. Unfortunately I have to report all but one failed within a year. The check valves seem to be the culprit. The motors, diaphragms, mechanisms, and the multiple mounting options made these a great choice, so I was very disappointed. They are easily serviced, but I was so frustrated with the continual failures that I took the whole lot out and replaced them with (admittedly inferior performance) Whale pumps. I still have them onboard in the hope that one day I can do something with them. 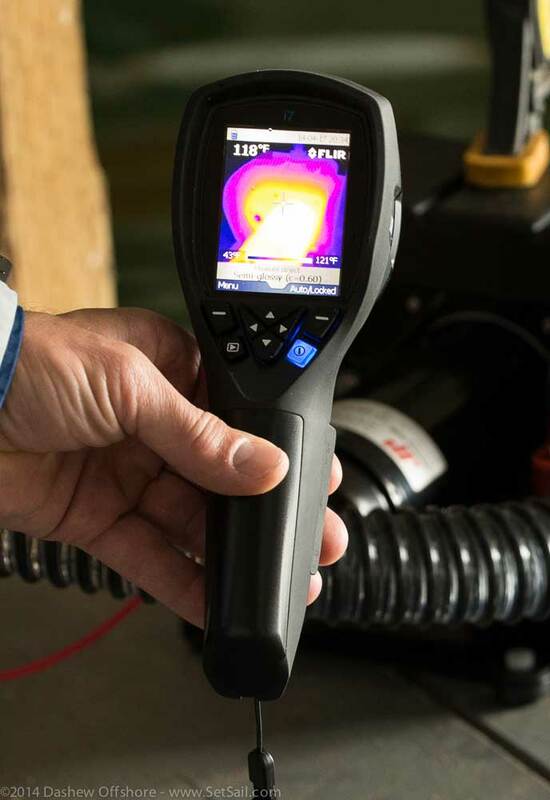 As you noted the performance in the readily available pumps varies considerably even though they may appear to have very similar specifications. A number of the pumps on the market are very cool in that they can rotate the head to accommodate different mounting positions. I believe that the Levac and Jabsco pumps which are very similar can do this trick as well. Another pump that you might want to test is the Plastimo unit. It appears to be a manual bilge pump with a motor fitted. There is one more I know of being commonly available, which is the Vetus unit. It too has rotating hose connections to ease installation. Surely your readers would be interested to know more test results and the reasoning for using this type of pump in the 1st place. Hello David. 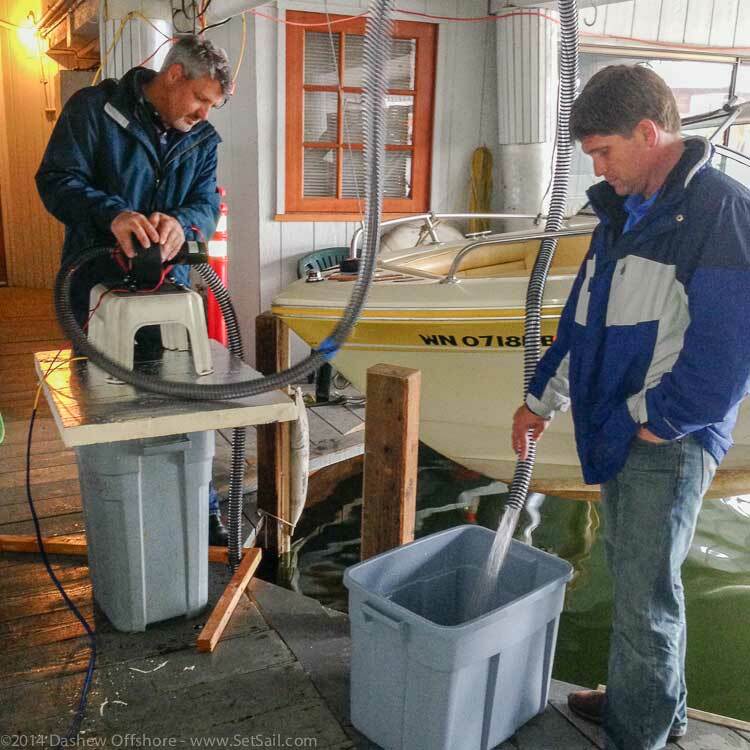 You are correct, we do not like the idea of using a high capacity centrifugal bilge pump mounted in the bilge, due to the potential for electrolysis in an aluminum boat. Our pump logic sounds similar to yours – in that the FPB’s are fitted with multiple “bilge” pumps throughout to deal with the occasional or potential accumulation of water (fresh or salt), with two fitted in the engine room. These are backed up by our high volume, hydraulically driven, crash pump. This pump can be valved to allow pick up in any of the main compartments. Your comments on failure of the check valves is very helpful and one that we will follow up on. I think we will get in a few more pumps for testing! I have used the same 3″ diaphragm pump for tank evacuation for over 30 years now without problems. It is driven by a small (.75 hp) AC motor. Reg the ones you are testing I have never had problems with the pump but always with the rather small “hobbylike” motor. 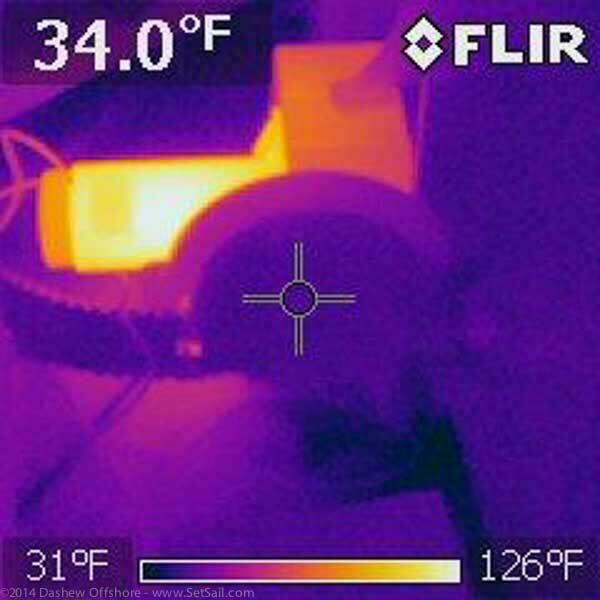 On the FPB you always have access to AC, why not go with this industrial proven technology? And speaking of pumps, what kind of pumps do you use for your pressure water system? Hi Nils. The reliability of an AC motor does sound good, but with bilge pumps on our list of critical components, we want a direct connect to the DC source (batteries, through the DC distribution). Though the AC system on the FPB’s is robust and we have had excellent results – we still see the DC system as the backbone of power should all else fail (Logic/circuit boards, etc.). We are currently using the Headhunter X-Caliber and Mach-5 for domestic water pumps. Hi Don. Jabsco’s discontinuation of the 34600 series pumps was the impetus for our tests. We have successfully fitted the Bosworth electric bilge pumps on a few of the FPB’s, but have continued to search for viable alternatives to the Jabsco. And, as an important UPDATE – the output of the Johnson was 6.45GPM, not the 7GPM originally stated. Didn’t realize they were discontinued…..therefore even more interested in you testing. One option to simplify piping is the use of a y-valve to allow your DC and crash pumps to use the same pickup. I have considered this approach recently after buying a couple of Tru Design electronic Aquavalves for plumbing my heads. http://www.trudesignplastics.com/products/21-electronic-aquavalve They are reasonably priced and so far appear to be quite well made. It might well be worth noting that in may applications I work on, the use of high volume centrifugal pumps is the preferred solution. These are typically high speed commercial/work vessels with very shallow bilges. 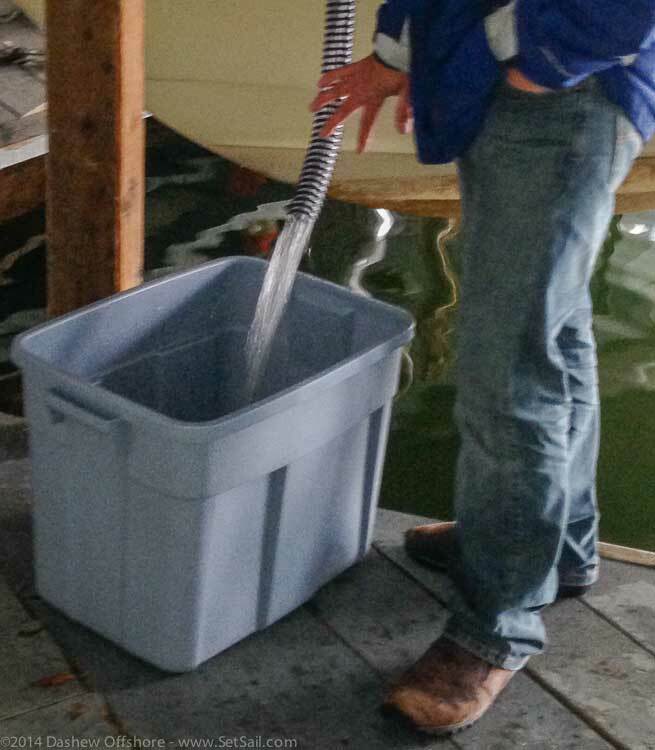 SOP’s for the crew is to keep the bilge clean and dry, which precludes any risk of stray current corrosion. These pumps move huge volumes of water, are cheap, and light which is important for high speed vessels. It also simplifies installation since there are fewer components and you don’t have to find a place to mount the remote pump. For vessels where a centralized crash pump is not feasible an option can be to install high flow submersible pumps above any normal accumulation of bilge water while retaining the low flow remote pumps to take care of any accumulation. Some stray current is certainly not of much concern in an emergency, when you really need the flow the centrifugal pumps offer. Hi David. Our bilge pump and crash pump systems are different hose sizes, but more importantly we want the redundancy of independent systems/plumbing. We view the engine room as the priority – so two independent bilge pumps and a crash pump (2″ pipe) rated at 160GPM/605LPM – is cheap insurance. Thanks for the heads up on Truedesign. I will pay them a visit next time I am in Auckland to check out their gear. Which model Bosworth pump did you use? Any further longer term results? Hi Don. 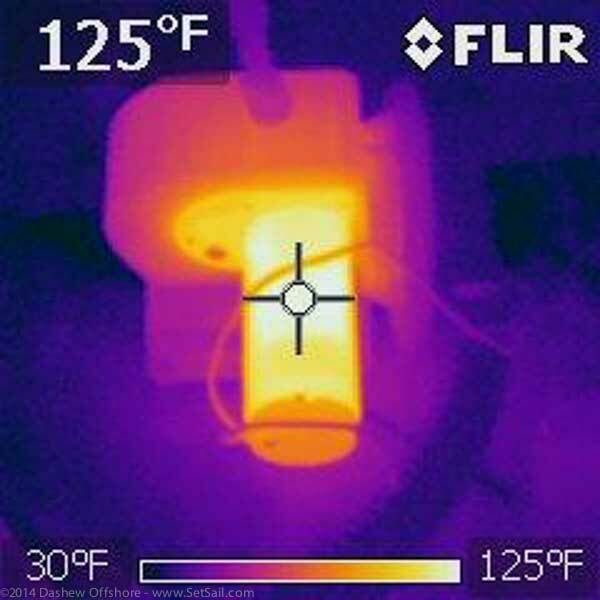 We were using the Bosworth GE line of 24VDC motorized pumps, rated at 10+GPM. As it stands, we believe the Johnson (SPX) may represent a better solution unless the higher capacity of the Bosworth is required. They have a bilge pump system where a balanced impeller is fixed on the prop axle. The housing is mounted around this, not touching the impeller, so no valves or bearings to service. Suction is self priming double sided along the prop axle on both sides of the housing. When no water present it will pump air to vent outside, or if redirected via a valve they will recirculate the air in the engineroom. If the output from these pumps where directed straight up and outwards under the deck and have a flapper valve or duckbill valve, they would let in very little water in a rollover. This may be a nice extra safety to have, they would useing insignificant power pumping just air around. I like the idea that they are basically a set and forget system, always at work. No real maintenance required. They will of course not digest your lost in the bilge golf balls.